There’s a new book out celebrating chefs, farmers and artisans in the Midwest – and a lot of the featured players are from Omaha. Including the book’s author, Summer Miller. I was one of a few lucky bloggers invited to watch Summer prepare a sample of recipes from “New Prairie Kitchen,” and hear her stories about the individuals she met in the making of the book. It’s all in a day’s work for me, this eating of good food while in good company. The book is part seasonal cookbook, part stories of the Great Plains, and filled with beautiful color photos by Dana Damewood. Summer invited chefs to share recipes that used at least one locally grown/produced/raised ingredient, and the resulting 50 recipes covered all imaginable courses and all four seasons (sorry, the fifth season, chocolate season, was mistakenly left out). 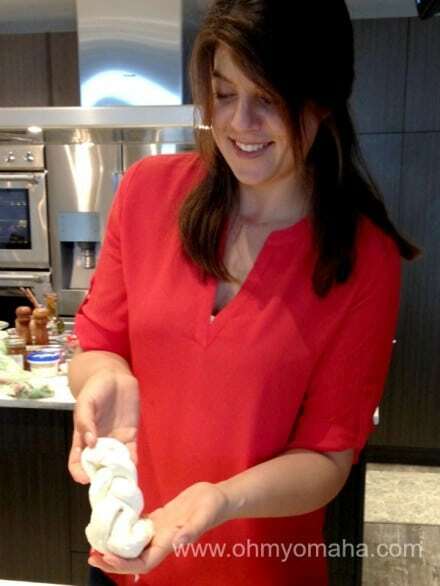 Summer Miller us braided mozzarella. Summer explained that it was important to have recipes accessible to people at different levels of cooking ability (and available time). “I don’t want moms to feel like this is something they have to pull off,” she told the four of us ladies – all mothers – sitting in front of her. Good, because while I like to think I love trying new food, and I cook a lot, there’s no way I’m making homemade sausage. But I just might try to make homemade ricotta. Mom ain’t got time for anything more. But maybe you do, so it’s a good thing both are included in this cookbook. 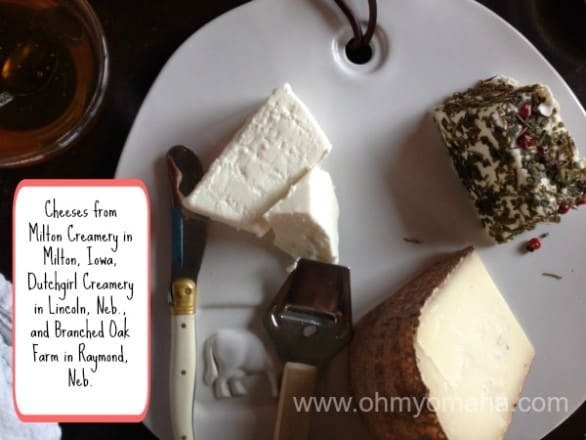 Cheeses from Milton Creamery in Milton, Iowa, Dutchgirl Creamery in Lincoln, Neb., and Branched Oak Farm in Raymond, Neb. Goat Cheese and Tomato Chutney Crostini recipe from Proof in Des Moines, Iowa. 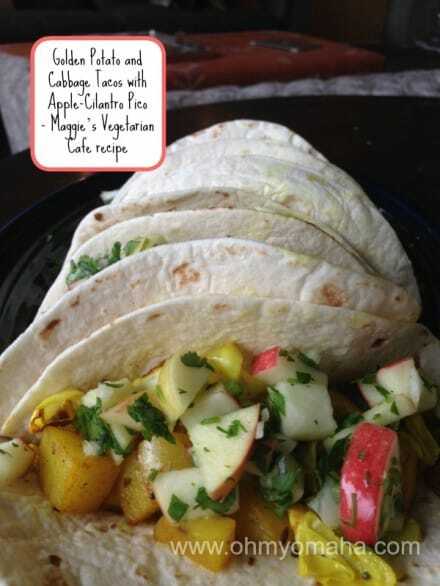 Golden Potato and Cabbage Tacos with Apple-Cilantro Pico recipe from Maggie’s Vegetarian Cafe in Lincoln, Neb. 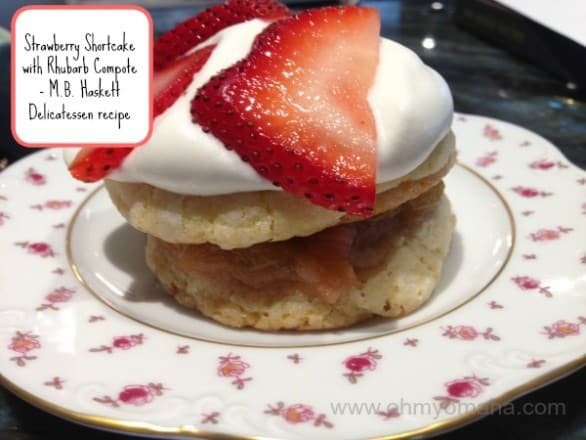 Strawberry Shortcake with Rhubarb Compote recipe from M.B. Haskett Delicatessen in Sioux Falls, S.D. I’m excited to dig into the book and try out some recipes. I asked Summer for some of her favorites, the ones that are on rotation in her house and pass muster with her kids. She recommends Bryce Colton’s cornbread, which is part of the Tesa, Poached Eggs, Roasted Tomatoes and Spicy Cornbread recipe. Bryce is the chef at The French Bulldog in Dundee. Other ones on in the book she makes regularly include Dried Fruit and Pumpkin Seed Granola from Kristine Moberg of Queen City Bakery in Sioux Falls, S.D., and the ricotta mentioned earlier, which you’ll find the recipe for in Toast with Homemade Ricotta and Fresh Strawberry Jam, shared by Nick Strawhecker of Dante Ristorante Pizzeria in Omaha. 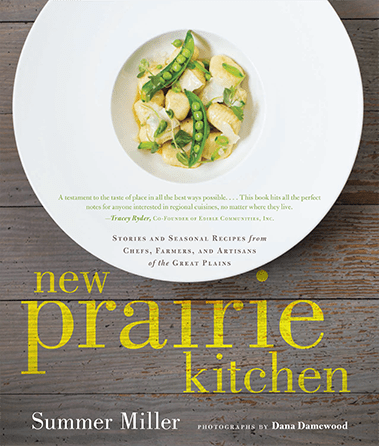 You can get “New Prairie Kitchen” online at retailers like Amazon . Or, better yet, go to one of the local events, buy the book there and maybe get that book signed by Summer! 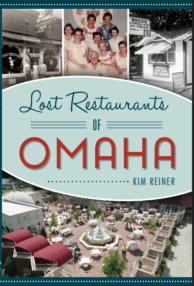 May 16 – 1 to 2:30 p.m., Provisions, 3157 Farnam St., Suite 7106., book signing with Summer Miller and Clayton Chapman, chef. Snacks will be served. May 18 – 5 to 9 p.m., Dante Ristorante Pizzeria, Omaha, four-course dinner featuring Clayton Chapman, chef of The Grey Plume, Paul Kulik, chef of The Boiler Room, Bryce Coulton, chef of The French Bulldog, and Nick Strawhecker, chef of Dante. 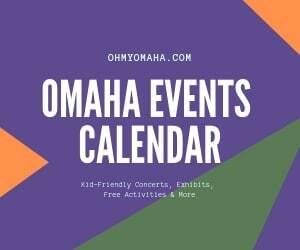 Cost is $100, RSVP at 402-932-3078 or email Adam Weber at aweber@dantepizzeria.com. Disclaimer: I was provided a complimentary lunch prepared by Summer Miller because she’s cool like that, and I was given a copy of “New Prairie Kitchen” so I can try my hand at mangling some recipes. This post contains affiliate links, which at no cost to you, if you make a purchase through the link, I receive a small amount of money to keep doing the thing I love to do – writing.